Tripp Lite's TLP6B offers economical AC surge suppression for protection of workstations, desktop PC's, telecom systems and other sensitive electronics. Built-in AC surge suppression shields connected equipment from damage and performance problems due to transient surges. 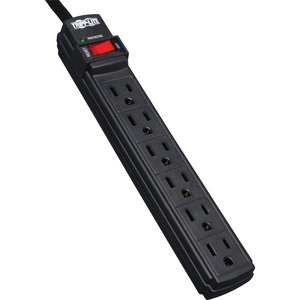 TLP6B offers 6 total outlets, 6 foot cord and diagnostic LED to warn of suppressor damage.